Bradley Buecker and Max Adler with Analy High School students Kendra Goff, Sullivan Rutherford and their lead actor. More than 600 students, families and mental health advocates gathered at the Crest Theatre in Sacramento on the afternoon of Tuesday, May 13 to celebrate the achievements of nearly 996 student filmmakers who participated in CalMHSA’s second annual Directing Change Video Contest. Created to empower young people to promote suicide prevention and end the silence associated with mental illness among their peers, the contest attracted an impressive 432 submissions from California high school and University of California students. Directing Change Video Contest submissions were judged by volunteer experts in mental health and suicide prevention, members of the media and professionals in filmmaking and video production. 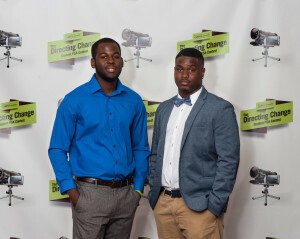 Films were judged based on how the entries creatively explored the topics while also adhering to guidelines about how to safely and appropriately communicate about suicide prevention and mental illness. This year’s line-up of statewide judges ranged from Hollywood actors and producers to leaders in education and mental health. Lending their expertise in film and television production, statewide judges included actor Max Adler, director and producer Bradley Buecker, producer Scott Budnick and assistant director and producer George Parra. 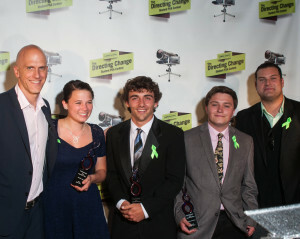 To view the full list of winners and winning videos, visit http://www.directingchange.org.